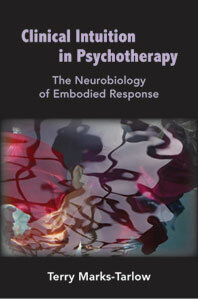 A systematic look at the role of “gut feelings” in psychotherapy. What actually happens in psychotherapy, outside the confines of therapeutic models and techniques? How can clinicians learn to pick up on interpersonal nuance, using their intuition to bridge the gap between theory and practice? Drawing from 30 years of clinical experience, Marks-Tarlow explores the central— yet neglected—topic of intuition in psychotherapy, sharing clinical insights and intuitions that can help transform traumatized brains into healthy minds. Bridging art and science, Clinical Intuition in Psychotherapy is grounded in interpersonal neurobiology, and filled with rich case vignettes, personal stories, and original artwork. In the early chapters of the book, Marks-Tarlow defines clinical intuition as a right-brain, fully embodied mode of perceiving, relating, and responding to the ongoing flows and changing dynamics of psychotherapy. She examines how the body “has a mind of its own” in the form of implicit processes, uncovering the implicit roots of clinical intuition within human empathy and emphasizing the importance of play to clinical intuition. Encouraging therapists to bring their own unique senses of humor to clinical practice, she explains how the creative neural powers of playfulness, embedded within sensitive clinical dialogs, can move clients’ lives toward lasting positive affective growth. Part of the Norton Series on Interpersonal Neurobiology, this wonderful guidebook will help clinicians harness the power of spontaneous intuitive thinking to transform their therapeutic practices.